Learn about the continents, oceans and divisions that make up the Earth with the printable flash cards. Continent One of the large, continuous areas of the Earth into which the land surface is divided. Equator An imaginary circle around the Earth halfway between the North Pole and the South Pole; the largest circumference of the Earth. Globe A true-to-scale map of the Earth that duplicates its round shape and correctly represents areas, relative size and shape of physical features, distances, and directions. Hemisphere Half of the Earth, usually conceived as resulting from the division of the globe into two equal parts'north and south or east and west. 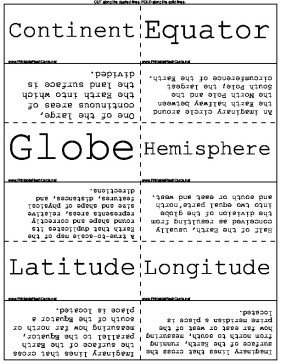 Latitude Imaginary lines that cross the surface of the Earth parallel to the Equator, measuring how far north or south of the Equator a place is located. Longitude Imaginary lines that cross the surface of the Earth, running from north to south, measuring how far east or west of the prime meridian a place is located. Prime Meridian An imaginary line running from north to south through Greenwich, England, used as the reference point for longitude. Sea Level The ocean surface. Map A picture of a place that is usually drawn to scale on a flat surface. Atlas A bound collection of maps. North Pole The northernmost point of the Earth. South Pole The southernmost point of the Earth. Geography The study of people, places, and the Earth. Eastern Hemisphere The half of the Earth to the east of the Atlantic Ocean including Europe, Asia, Australia, and Africa. Western Hemisphere The half of the earth including North America, South America, and surrounding waters. Regions a part,portion or area having no fixed boundaries.